Posted in Blog on October 3rd, 2018. Each year, along with providing cutting edge curriculum, certification courses, professional development, industry presentations, lectures, workshops, and fun, the NAPT Conference also serves as a showcase for the newest products and the latest technology the pupil transportation industry has to offer. 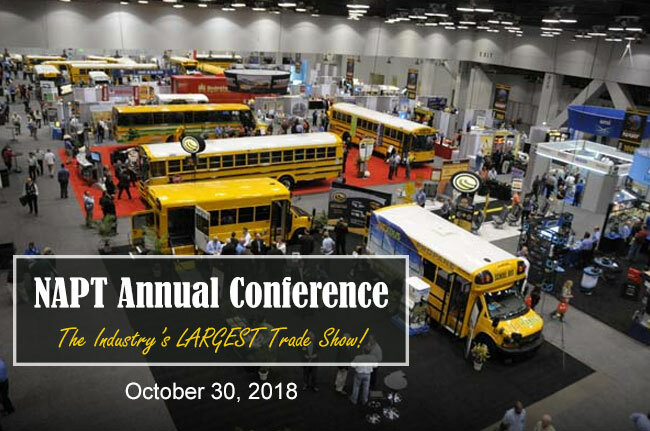 Join NAPT in Kansas City, MO on October 30 for NAPT’s One-Day Trade Show, the biggest and best gathering of school bus manufacturers and school transportation product suppliers along with pupil transportation professionals looking to learn about the latest products and services on the market today.